Protesters gathered outside the Berri-UQAM metro station chanting, “this is what democracy looks like” at the riot police, who had already formed a barrier on the sidewalk. Protesters began marching east on Ste. Catherine St. at around 8:20 p.m., but police didn’t allow them to pave their own way. The protesters were shepherded in a route that quickly circled back to where the march began. After a few attempts by protesters to break through police barriers blocking streets deemed “off-limits,” protesters were able to force themselves through a line of non-riot police on St. Denis St. From there, they ran south towards René-Lévesque. Police declared the protest illegal at 8:40 p.m., just 20 minutes after it began. The police fired tear gas at protesters at the corner of Ste. Catherine and St. Hubert, causing the crowd to disperse. Willie Wilson, a Link contributor who was gassed at the intersection, tried to avoid the gas with half a dozen other protesters by running into an IGA supermarket along Sainte-Catherine. “A whole bunch of the tear gas got [inside the IGA],” said Wilson. “All the clerks had been tear gassed and all the managers, and they were trying to close the doors but they couldn’t [do it] fast enough. Following the tear gas, police rushed protesters around de Maisonneuve and St. André. One protester was pinned to the ground by police and was then arrested by police, the lone arrest of the night. 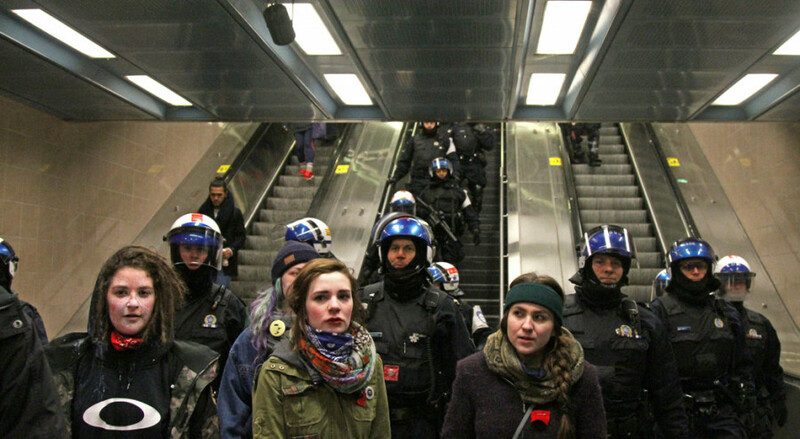 The police tried to stop protesters from regrouping by funneling and kettling a number of them into the Berri-UQAM metro.